Usually before bedtime I like to unwind with one the following: a little guitar playing, tv show watching, muscle admiring, music listening or video game playing. Lately the video game playing has won out over the rest. I really should not play right before bed because there is nothing like getting all amped up and blasting bad guys to relax. Regardless, that has been the general routine over the past few weeks. There were some great zombie-themed sales going on in video game land this weekend and I decided to take the bait. Lately everyone has been talking about Left 4 Dead 2, how fun it is and this weekend it was half price. A few years back I played Left 4 Dead (one) at Ty’s house and it was fun. Although I do remember having to sit close to his tiny 32″ TV in order to see my character, plus he made me play on the bottom screen which is just terrible since my eyes tend to wander towards the top of the screen and end up watching his screen. It’s not very helpful to look at the wrong screen when you’re surrounded by pixelated zombies. In Left 4 Dead you play as one of four survivors after a zombie outbreak, I really don’t know much more of the story beyond that since i haven’t really spent that much time in it. From the little I have played I think that is pretty much the goal of the game, kill zombies/stay alive. Yesterday I downloaded L4D2, played a bit of it and it was fun although the zombies were a lot faster than I had remembered. Aren’t zombies supposed to be slow and lumbering? When did the fast zombie begin to be the norm? I usually have the unique ability to watch movies or play these games before bed and not dream about them. A few months back I re-watched HBO’s Band of Brothers and although I’d often watch them right before bed, I never dreamt about war or killing or anything. It wasn’t until I started reading books about the men portrayed in BoB that I began to have the most vivid dreams about war and killing. Interesting how the brain works. 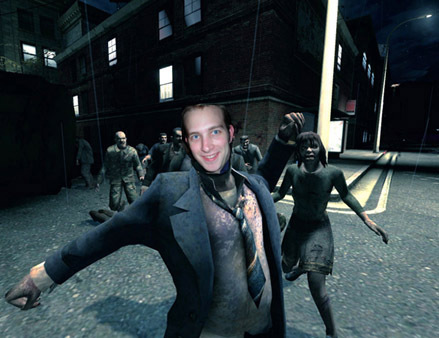 Last night I fell asleep and was immediately greeted by zombies surrounding me. The dream was very matter of fact and not scary at all. Even though I was surrounded I was simply moving around and circle strafing while I efficiently and methodically blasted the undead away from me. I was as calm as taking out the trash. After I had finished eliminating all the bad guys I threw my guns down on the ground (much like a vid game) and went inside. I have no idea why, but once I was inside I immediately made my way over to a pull up bar and began doing inverted pull ups because y’know, who doesn’t want to dream about working out? I was several pull ups in when without warning something was behind me. I stopped for a split second to listen as the silence was broken by the most unearthly growl man has ever heard. I immediately knew it was a zombie dog and I jerked my body up (remember I was upside down) while I let out a whimpering yell that crossed over into real life causing me to wake up and kick the wall. I laid awake in bed with only the sound of my racing heartbeat filling my ears. For a split second I was too scared to roll over and look behind me for fear of a slobbering zombie dog. I finally did roll over and was relieved to not find any undead canines staring at my face. I don’t think in the history of my dreaming I have ever woken up screaming…err yelling. Men can’t really scream IMO so I’ll call it a higher pitched yell. Maybe it’s time to start playing gentle music before bedtime or flexing my bubbly biceps in the mirror instead of blowing heads off of half-decomposed people. Who knows, we’ll see what tonight brings.